the GBP-USD has just got to his highest point since august 8th, in my opinion will continue to recover in the next couple of weeks. what are your thoughts for the long term? GBP/USD rallied sharply this week and it reached a high at 1.3200. Since the pair is so bearish, I think the move to the upside will reach the last high at 1.3266 and if it breaks out above it will keep climbing to 1.3310, which is the MA89 on the W1 time frame. GBP/USD has almost reached the resistance at 1.3310, which is the MA89 indicator on the weekly time frame - the last high was at 1.3287. The question is whether it will succeed in breaking out above that level or not. If it does, next target is likely at 1.3400. In case of a pullback it will probably fall back to 1.3200. GBP/USD is retracing as I thought it would and it has almost reached the support at 1.3200. It is possible to break out below that level, I already have a short position. That short position was a mistake. 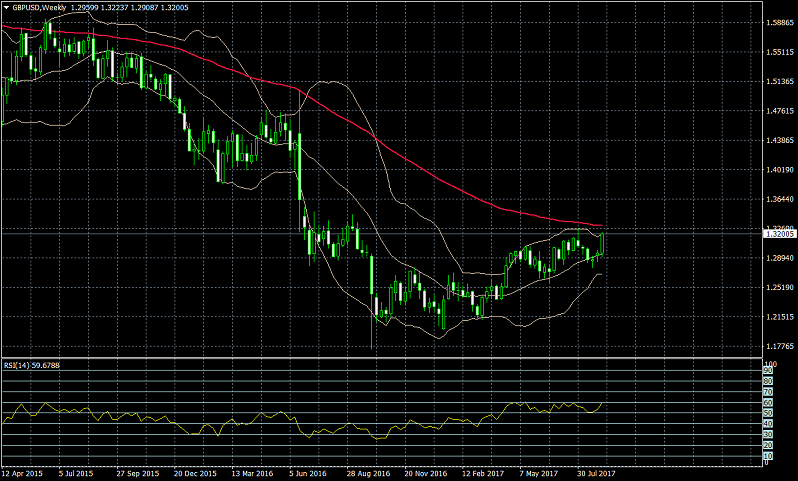 GBP/USD broke out above the resistance at 1.3300 which is the MA89 indicator on the W1 time frame. After such a breakout the rally will most likely accelerate, I think next target will be around 1.3450. GBP/USD rallied hard after the BoE news on Friday. It broke out above 1.3500 and continued climbing. I wouldn't be surprised if the pair eventually reached 1.3700. FOMC will be announcing the US Federal Funds rate this week, so expect a lot of volatility on all USD-related pairs, GBP/USD included. The pair is bearish for now after forming a double top at 1.3618. Next target is likely around 1.3460. The news that FOMC won't hike the interest this month caused a significant drop, but the pair remained within the range between 1.3460 - 1.3700 and it looks like that range won't end before the market closes today. GBP/USD rebounded from 1.3340 despite breaking out below the support at 1.3375, which is the MA89 indicator on the H4 time frame. I think the pair will retrace back to 1.3450 - 1.3470. GBP/USD continued its overall bearish trend yesterday and finally reached the support at 1.3030, which coincides with the MA89 indicator on the D1 time frame. I think a breakout below that level as well will likely lead to a drop towards 1.2800. 1.3030 proved to be a very strong support after all and GBP/USD rebounded from it. I think it will retrace back to 1.3250 - 1.3260. GBP/USD bounced off from 1.3260 and is at the support at 1.3115. I think that if there's a breakout it could drop to 1.3070 again. It looks like the move to the upside isn't over after all. The pair is testing 1.3340 and it could break out above it to reach 1.3400. On the other hand, a pullback from that resistance could mean a new drop to 1.3200. 1.3340 held out, after all and the pair pulled back from it. Not only did it reach 1.3200 but it broke out below that support. Next target is likely around 1.3100.